A dark green for light. It was the first thing we noticed when we came through the gate into the courtyard here–twenty one years ago last May. 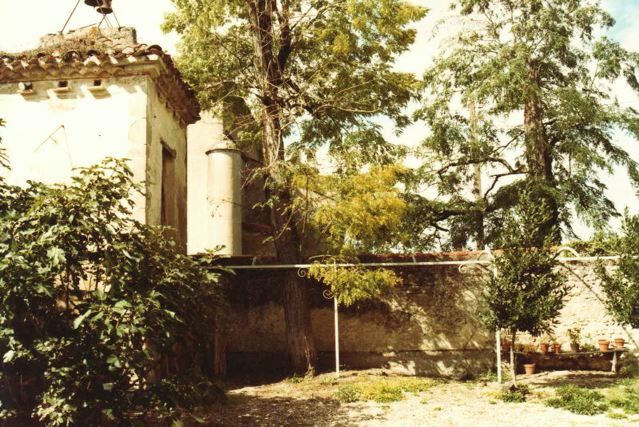 The fig tree and the double rainbow put us in a receptive mood even before we entered the house.More of a shrub back then–reaching up beside the outhouse that doubled as a pigeonnier–there was no hint of the sprawl it would become. We didn’t know about fig trees and their prodigious ability to grow. We would have had no problem telling the time from the sundial positioned, unusually, on the pigeonnier–if we’d known how. Today the tree–shrub no longer–reaches eagerly towards the house, acting as an effective parasol at lunchtime. We had it pruned this year but that has barely held it back. The branches are groaning under the weight of the fast ripening fruit, making passageway to the house hazardous for a tall person. 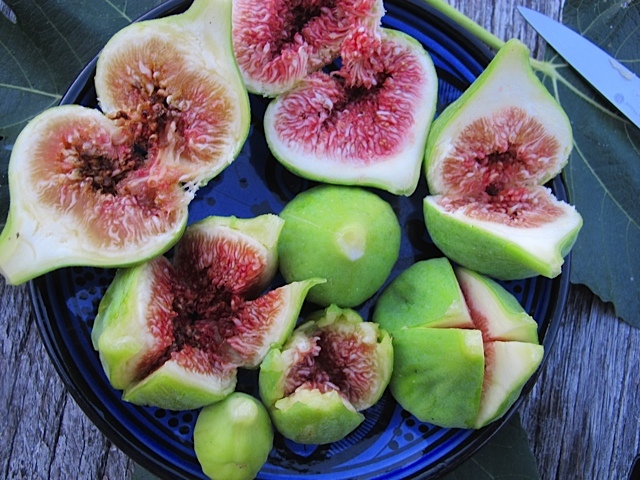 The figs are the green or “blanche” variety and sweeter–to my mind–than the more romantic looking purple ones. The green light for picking them is a particular light green–and a heaviness in the hand. Watch out though when reaching up–you are not the only one attracted by the ripeness. Wasps and hornets bury their heads in the sweetness leaving their tails free to sting the fingers of rivals! Delicious they are but not worth the pain of a hornet’s sting. Have loved your post about figs. What beautiful trees. Living in the midwestern United States I would have to grow fig trees in containers and winter them indoors. Might make a wonderful project! what a lovely courtyard! It remembers me the house we used to rent during summer in a mountain near Rome. 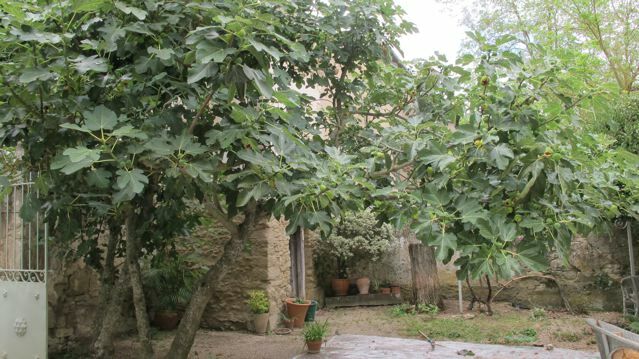 It was surrounded by a chestnut wood and there were some fig trees whose branches arrived on our terrace so it was easy to pick them. An the far figs were reached from us with a butterfly net stapled on a reed….. how ingenious can be children when they are greedy. 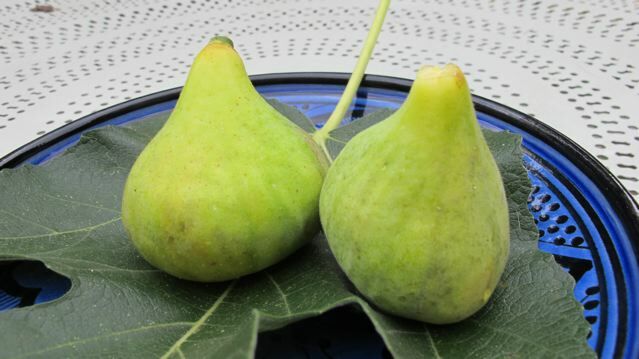 Here we have also purle figs that are delicious, especially in September, in Southern Italy… maybe too sweet and not good for diabetes. I think half a perfect fig might be allowed! 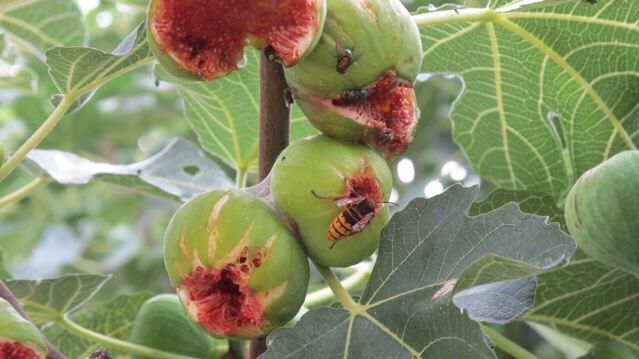 Yummy, I love figs, but I hate the hornets. When you get stung by a bee, you have a little revenge, because they die once you are stung.Unfortunately, hornets and wasps can sting you over and over, so no revenge!